Before I got my first Serger, I pondered about it for along time. 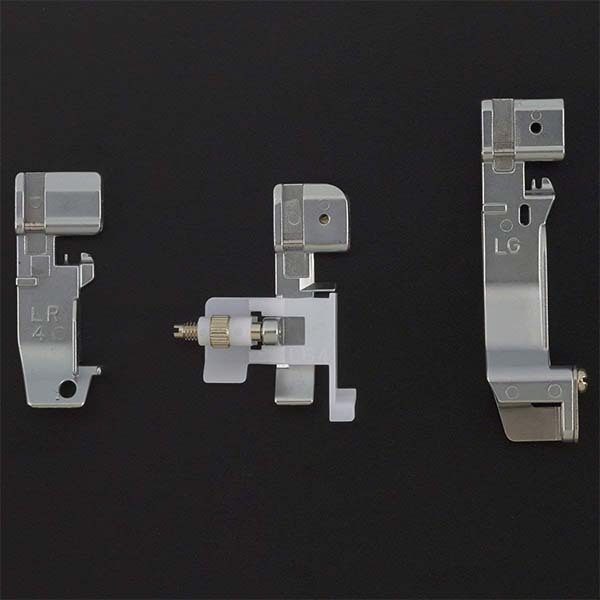 When I was first looking to buy an over-locker (which is what we call a serger in Australia), they were very expensive, and to be honest, just a little bit scary. So many threads and dials to consider, but I wanted to get the best serger I could find. Back then the internet wasn’t well established so looking for serger reviews wasn’t all that easy, so I had to go by word of mouth. I was also a bit wary because, a serger machine also cuts the fabric as it sews, so to me this meant one slip and maybe disaster. But once I had a good stern talk with myself about how silly I was being, and that I could master this, I went out and bought a Pfaff HobbyLock 776. And I loved it right from when I got it home and unpacked it. This is me with my old Pfaff serger. If you look close enough, you can see the rust forming on some of the metal bits. I used to live right on the ocean and the sea air would rust anything given a chance. After 20 years it was time to buy a new overlocker. If you are feeling a bit like I did back then, then I can tell you that today’s machines are so much easier to thread and not the least bit scary. Quilters seldom use a Serger or Overlocker to make quilts. But that’s not to say you can’t use one. And a serger is a such a versatile machine to have. You can use it to join lace, create decorative finishing stitches, create ruffles and gathers on all types of fabric such as cotton, knits, linen and lace. I used it mostly back in the day for making clothes for me and my grandkids. There are so many Sergers/Overlockers available that your head will spin trying to work out the features and benefits of each machine. When I am looking to purchase a machine, I always make it a policy to buy the best machine I can afford, and one that has all the features I want. It has to be easy to thread and operate. Sometimes it’s better to spend a little more to ensure you get the results you desire. So I did eventually get a new serger. Honestly, my Pfaff still wins hands down but that was one of the best at the time and quite expensive. Now I have a not as expensive Janome MyLock 744d which isn’t a bad machine but it doesn’t beat my old Pfaff. Still, if you are brand new to it all, you really don’t want to go with an expensive machine. As a beginner you want something that you can get the hang of quickly without paying a huge sum of money. If you really get serious with it all, you can always upgrade, but for a starter machine you want something solid and reasonably priced. With this in mind, we did quite a bit of research and came up with the Brother 1034DX. What is a Differential Feed I hear you ask? Well, a Serger has two sets of feed dogs which sit underneath the presser foot and move the fabric through the machine. The Brother 1034DX gives you the ability to adjust the feed dogs and this gives you smooth, even stitching. 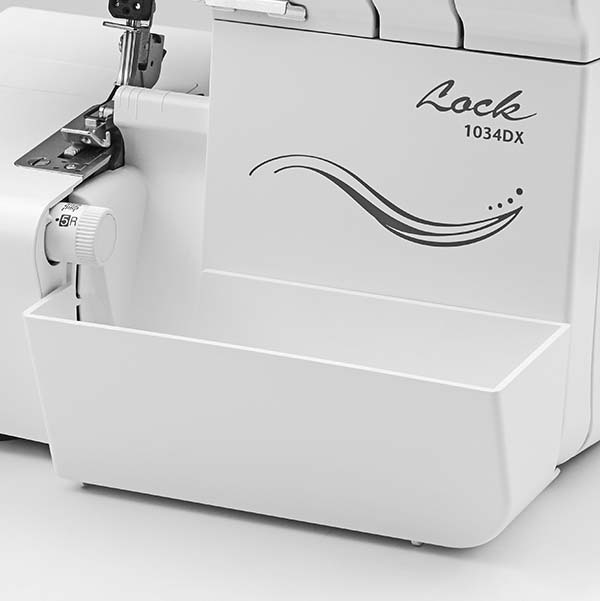 Being able to control the feed dogs helps to prevent any puckers when you are sewing lightweight fabrics, it also allows you to create gathers and decorative edges. 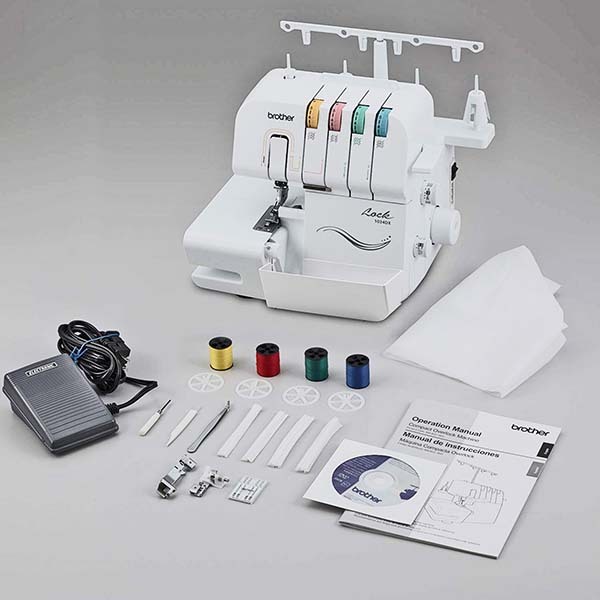 The 1034DX Serger gives you the flexibility of using 3 or 4 threads to sew your projects. You can use 3 threads with 1 needle to overlock knits, slacks, blouses etc. 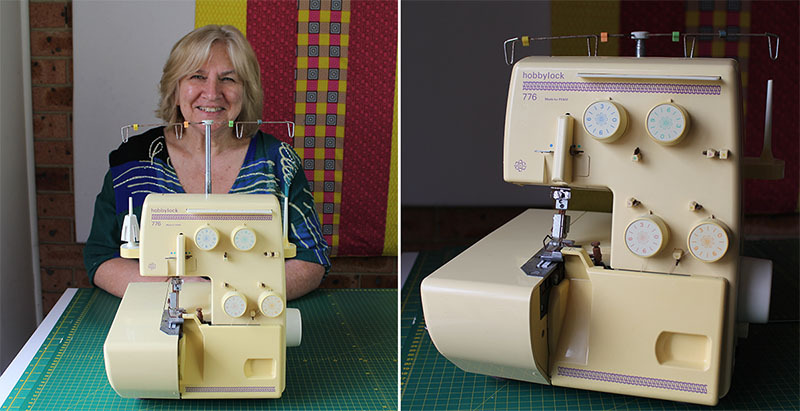 With this Serger you can sew up to 1,300 stitches per minute. So you can get those projects finished faster. However, you can sew slower just by lifting the pressure on the foot controller. This means you have control over the speed you sew and you can keep the speed at a comfortable level for you. You may be cautious starting out or you may be over-locking something that you want to have more control over, so don’t feel you need to go flat out every time. I think this is the most daunting part for someone starting out. Threading all of those threads through the right places. The Brother 1034DX has color coded guides printed on the machine. By following these color coded guides you can see exactly where each thread is supposed to go. The lower feeds can be a little tricky to thread, but this is common with most Sergers. Tweezers help with this task. TIP: When you need to change your thread color, pull the threads back behind the feed dogs, snip the thread and tie on the new colour. Run the machine on some scraps of fabric until the new color takes up. This saves having to re-thread the whole machine. Making adjustments to the width of your stitch is super easy. 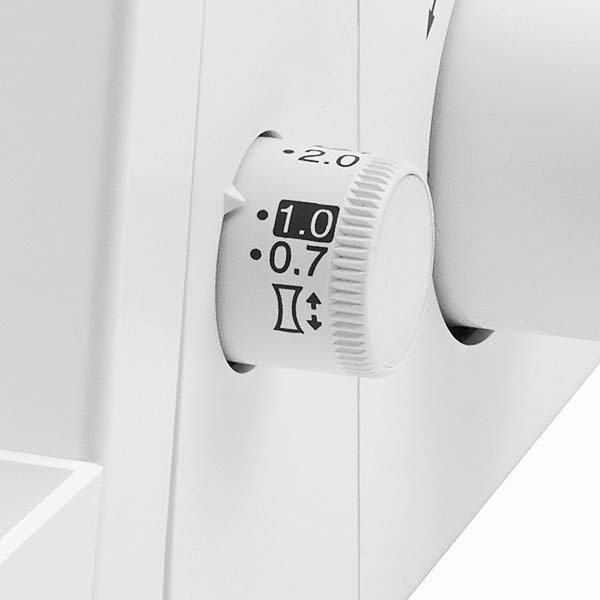 The Adjustment dial allows you to change the stitch width between 5.0mm (3/16″) and 7.00mm (9/32″). By adjusting the stitch width you can create serged seam finishes that lie flat, especially on those lightweight fabrics. 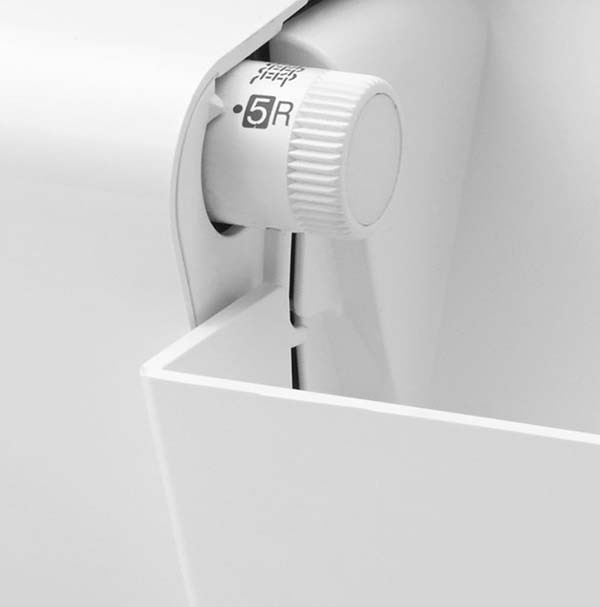 The trim trap catches the fabric that is trimmed from your project. It is easily detachable to empty. When you aren’t sewing, you can story your foot controller in the trim trap. Standard Foot – this is your general purpose foot. 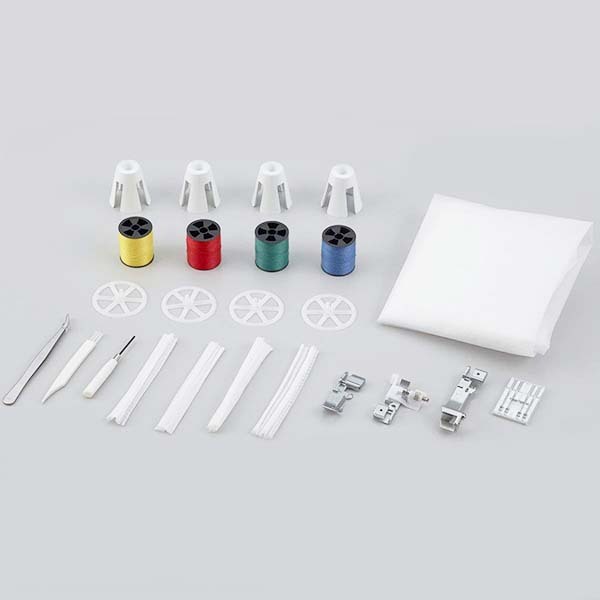 Use it for a wide range of sewing projects such as seams, and rolled hems. Blind Hem Stitch Foot – Allows you to create blind hems on a variety of fabric. Also used for attaching lace, edge stitching and edge joining. You can also use this foot for embellishing and utility stitching. Gathering Foot – Makes gathering easy, as it connects the fabric and finishes the edge in one step. There is a channel on the foot that secures the fabric and helps to eliminate the need for pins as you create a serged edge and gather single or double layers of fabric. The price for this machine averages around $220.00. Like all machines, the price does fluctuate and if you see it for under $220 you are getting it at a good price. The Brother 1034DX has a 25 year Limited Parts Warranty. Brother provide free technical phone support for the life of your machine. If you are brand new to using a Serger you may find the classes on Craftsy helpful. This machine requires oiling before you use it for the first time. Check the manual to see where the oil points are. 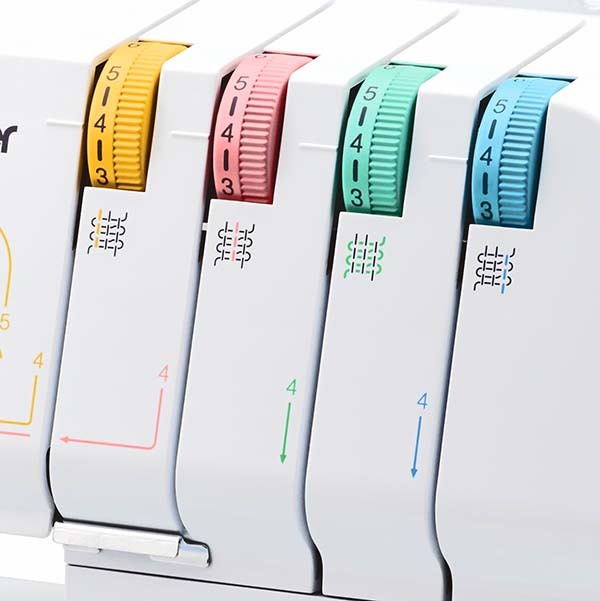 Where Can I Buy the Brother 1340DX Serger? As always, the best price can usually be found on Amazon. Check it out on Amazon here. 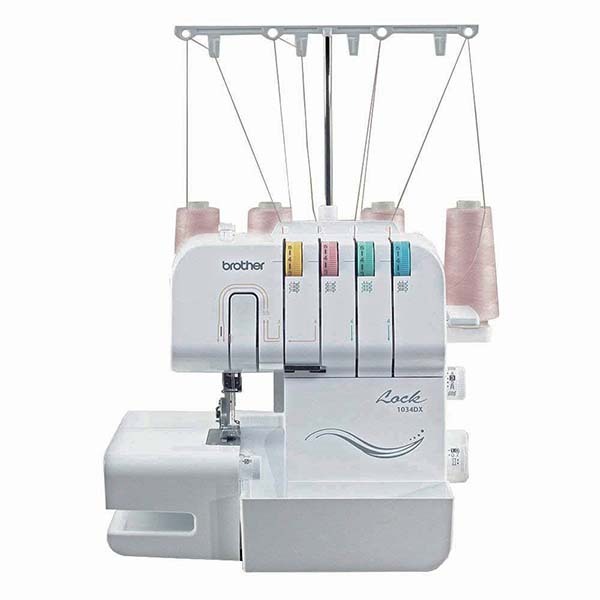 You can also read the serger reviews for this machine while you are there.